Definition: Charles’ Law describes the relationship between Temperature (T) and Volume (V) while the number of moles (n) and pressure (P) remain constant. Up, Up, and Away! A hot-air balloon uses Charles’ Law to help it fly. 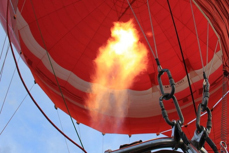 As the gas inside the balloon is heated (↑ T), the balloon inflates (↑V). The warm air then rises, and so does the balloon. Problem: A sample of carbon monoxide gas occupies 3.20 L at 125°C. At what temperature will the gas occupy a volume of 1.54 L if the pressure remains constant?